Macedonia says five Kosovans led the armed group which was involved in deadly clashes with security forces in the northern town of Kumanovo. Eight officers and 14 gunmen were killed in the fighting, Interior ministry spokesman Ivo Kotevski said. Those named were members of the now dismantled Kosovo Liberation Army. Mr Kotevski said the operation near the Serbian-Kosovan border was now over and the armed group had been "neutralised", with a large amount of weapons seized. Last month, Macedonian police said about 40 ethnic Albanians from Kosovo briefly took over a police station in the village of Gosince near the border, demanding the creation of an Albanian state within Macedonia. In 2001, rebels demanding greater rights for the ethnic Albanian minority launched an uprising against the government, and tensions have continued despite a peace deal. About a quarter of Macedonia's two million population are ethnic Albanians. Sami Ukshini, Beg Rizaj, Dem Shehu, Muhamet Krasniqi and Mirsad Ndrecaj were the leaders of the armed group that clashed with police in a suburb of Kumanovo, some 40km (25 miles) north of the capital, Skopje on Saturday, the interior ministry spokesman said. Only one of the 14 uniformed bodies had been identified - that of another Kosovo national, named Xhafer Zymberi, said the spokesman. "More than 30 terrorists, mainly Macedonian nationals and one from Albania, surrendered yesterday [Saturday] to the police forces," Mr Kotevski added. He said 37 police officers were also wounded in the clashes. Residents returning to the city are finding many of their homes damaged as a result of the fighting, one Reuters reporter at the scene says. "It's total destruction. Thank God we're safe," Haki Ukshini said after finding his home largely destroyed. 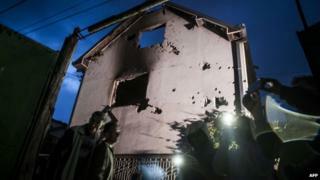 The men who surrendered would face Macedonian justice, Prime Minister Nikola Gruevski said. The group had tried to destabilise the country, he said, after paying tribute to the security forces. His government is already under pressure over claims of illegal wire-tapping and police brutality. The opposition and the government have accused each other of deliberately destabilising the country. Nato Secretary-General Jens Stoltenberg said he was following the situation with "great concern" and urged all sides to "exercise restraint and avoid any further escalation, in the interest of the country and the whole region". Earlier, the European Commission issued a similar call. Macedonia, which is a candidate for European Union membership, is observing two days of mourning.